Home to over 260 million people and more than thirteen thousand islands, the world’s 4th most populous country presents both huge opportunities and unique challenges for any business setting up shop there. But for these businesses to thrive, web and mobile penetration will need to improve so that the country can enjoy the economic benefits. 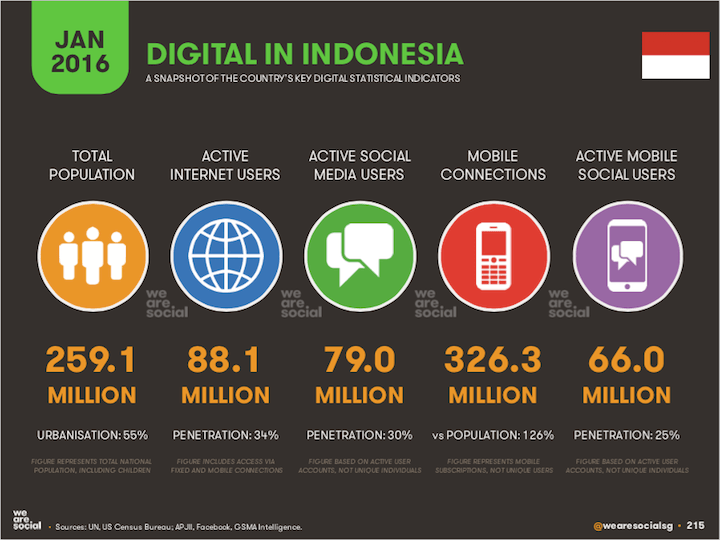 According to We Are Social’s compendium of world digital stats, Indonesia now has 88.1 million active internet users, up 15 percent over the past 12 months. While things have certainly improved in the past few years with President Jokowi’s ambitious plan to attract high-tech giants to the country through infrastructure investments and introducing more flexible regulations, lots more remain to be done. At Telecoms World Asia 2017, we’re bringing together key players in Indonesia’s telecoms market to discuss plans to improve Internet penetration and feed the growing bandwidth-hungry population. Early confirmed speakers include Mr Bastian Sembiring, Vice President of Wholesale & International Network, TELKOM Indonesia, the country’s largest telecoms operator. More speaker announcements to be revealed soon, so keep a lookout for our event updates as we bring you more news on Telecoms World Asia 2017.